← COME BRIGHTEN YOUR NEW YEAR ON JANUARY 25TH! Okay, here’s the big news! Once again, we’ve decided to do a promotion for my comic adventure novel Problems of Translation, or Charlie’s Comic, Romantic, Terrifying, Loopy Round-the-World Journey in Search of Linguistic Happiness! Starting today and for the next 3 days–March 9, 10, & 11th–you can download the kindle version of the book for free! This may be the last time we can offer the kindle edition for free! So, if you don’t have a copy, please take advantage of the offer, and tell your friends! Actually, you can gift it to a friend! And if you like my book, PLEASE PUT A REVIEW ON AMAZON (it doesn’t have to be a long one), and ask your friends to do so, too, because reviews do matter. Meanwhile, I’m at work on a short story tentatively titled, “What Goes Around Comes Around.” Later on, I may tell you how this particular story began…. 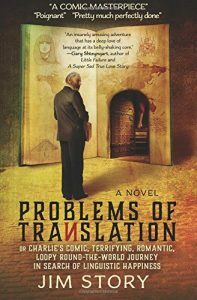 This entry was posted in More About Jim, On Books, On Writing, Problems of Translation -- A Novel, Whatever and tagged #free, #kindle, fiction, literary fiction, litfic, novel, Problems of Translation, writing. Bookmark the permalink.